Corporate or Group events are available upon request. Groups of four (4) or more will be an interesting way to entertain your guests, employees and their co workers. Watch the excitement on their faces as they compete against each other for the title of "Best kart driver" at Xtreme Motor Sports and the bragging rights within the company. Not only will you get to drive a kart with speeds up to 50 mph, but you will receive a meal with the deal. 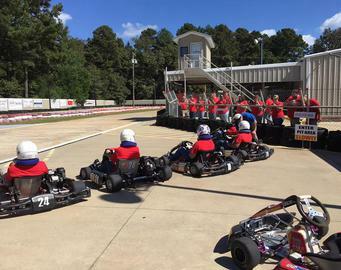 For more information, please call to schedule your group outing at Xtreme Motor Sports venue. Get your photo at winners circle for your bragging rights.